The tickets, worth $50,000 each, were bought in Falls Church, Lorton and Coeburn, Virginia, for Jan. 13's Powerball drawing. The tickets will expire at 5 p.m. Tuesday. The $50,000 winning tickets matched 4 out of the 5 winning numbers, plus the Powerball number. Check your handbags, your wallets, your pockets, your closets, your glove compartments ... you get the idea. 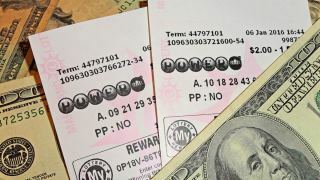 Three Powerball tickets, worth a cool $50,000 each, are about to expire in Virginia, lottery officials said. The tickets were bought for Jan. 13's historic Powerball drawing, which had a massive jackpot of $1.58 million. Even though these particular tickets didn't score the jackpot, we're still pretty sure the winners would be thrilled to realize just what they stuffed into a drawer last winter and forgot about. The winners need to get moving, though -- the tickets will expire at 5 p.m. next Tuesday. Anyone with a winning ticket should contact the Virginia Lottery as soon as possible, lottery officials said. The winning numbers for Jan. 13's Powerball drawing were 4, 8, 19, 27 and 34, with a Powerball number of 10. The $50,000 winning tickets matched four of the first five numbers, plus the Powerball number. Unclaimed Virginia Lottery prizes go to Virginia's Literary Fund for educational purposes, lottery officials said.